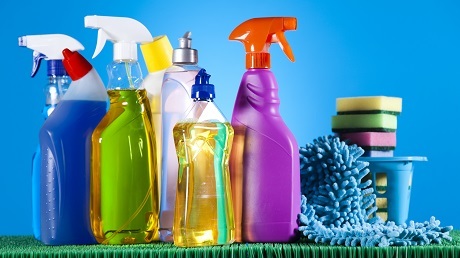 Very often cleaning experts say that it is very important to use environmentally-friendly cleaners, especially at home. Today we made up a lift of cleaners that are easy to prepare, but that are very effective in use. If you’ve found out that you don’t have your favorite cleaner, just mix up a new one that will surely become your new favorite one. To prepare this scrub you will need one half of a lemon and ½ cup of borax. Dip your half of a lemon into borax and scrub the surface. After cleaning, rinse the surface thoroughly. Don’t use it on marble or granite surfaces. This cleaner will work perfectly on ovens and grills. You need to mix ½ cup of sudsy ammonia with one gallon of water. Use a sponge and mop it in the solution. Apply on a greasy surface. After cleaning rinse thoroughly. The glass cleaner is perfect for mirrors and windows. To prepare the solution, you need to prepare 2 cups of water, ½ cup of white vinegar, ¼ cup of rubbing alcohol – 70% concentration and several drops of your favorite essential oil. Mix the ingredients and pour into a spray bottle. And now just spray it on a paper towel and clean glass surface thoroughly. If you don’t want to have streaks on your windows, do not clean them on a hot sunny day. This all-purpose cleaner not only perfectly cleans the surfaces, but also deodorizes them. In order to prepare it, mix 5 tablespoons of baking soda with a quart of warm water. You can use it everywhere in the kitchen, clean the inside of the fridge, all kinds of appliances, etc. This stain remover work great on clothes with horrible stains. You will need a gallon of hot water, one cup of powdered dishwasher detergent and one cup of regular liquid chlorine bleach. Do not use concentrate. Pour all the ingredients into a plastic bowl and soak your clothes in it for 20 minutes. In 20 minutes check the stains, if they are still there, let the clothes soak for a little bit longer. Then wash your clothes as usual.